The aardvark, a highlight for anyone on a game-viewing African safari, will become increasingly rare as the world warms and dries, and the consequences go well beyond a decline in aardvark safari encounters. According to researchers studying this elusive mammal, sometimes classed as one of the “Shy 5”, in South Africa’s Kalahari Desert, aardvarks prove to be highly susceptible to the warmer and drier climates that are predicted for the western parts of southern Africa, in the future. 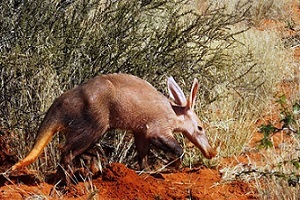 During the study of a number of aardvarks by researchers of the Brain Function Research Group at the University of the Witwatersrand, all but one of the study animals – as well as other aardvarks in the area – died because of a severe drought, with air temperatures much higher than normal and very dry soil in the area. “While unusual now, those are the conditions that climate change is likely to bring as the new normal,” says Professor Andrea Fuller, the Research Group’s director. Dr Benjamin Rey studied the aardvarks as part of his postdoctoral studies. 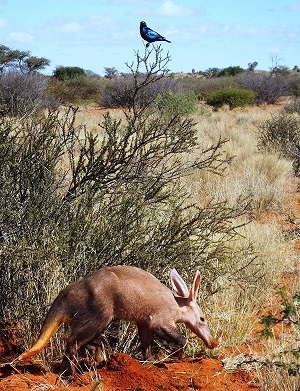 Along with his colleagues, he used the new technology of “biologgers” (miniature sensors attached to computer chips and implanted into the aardvarks by wildlife veterinarians), to study the activity patterns and body temperatures of aardvarks living in the Kalahari. The researchers were not to know that during the year of their study there would be a severe drought, which led to the death of the study animals. “It is not because the aardvark’s body can’t take the heat, but that the termites and ants that they rely on – not just for food but also for water – can’t take the heat and aridity of changing climates,” says Rey. Aardvarks usually sleep during the day in burrows that they have dug, and emerge at night, to feed on ant and termites, using their long, sticky tongues to sweep up thousands of insects. However, during the drought, the termites and ants, on which the aardvark depends for body energy, were not available. The aardvark progressively became skinnier and bonier. They even tried sun-basking to save energy, but many ultimately died. Their body temperatures dropped to as low as 25°C just before they died. Rey says that this curious-looking creature – described as having the snout of a pig, the ears of a rabbit and the tail of a kangaroo – is much more than just a curiosity to be checked off a bucket list. Climate change in southern Africa affects animals through the direct effects of increasing air temperatures and aridity. Wild dogs, for example, reduce hunting activity as temperature increases. But the indirect consequences of heat and aridity may be more pervasive. Disappearance of aardvarks, and with them the burrows that they dig, will have knock-on effects for many other animals. “Populations of many animals in South Africa are already declining as a result of habitat loss and over-exploitation,” says Fuller. “Climate change adds an additional threat, which may push species to extinction faster. By 2050, the aardvark may not be the only species removed from tourist checklists”.